A troy ounce equals 31.1034768 grams, but, for most purposes, 31.103 g, or even 31.1 g, works just fine. 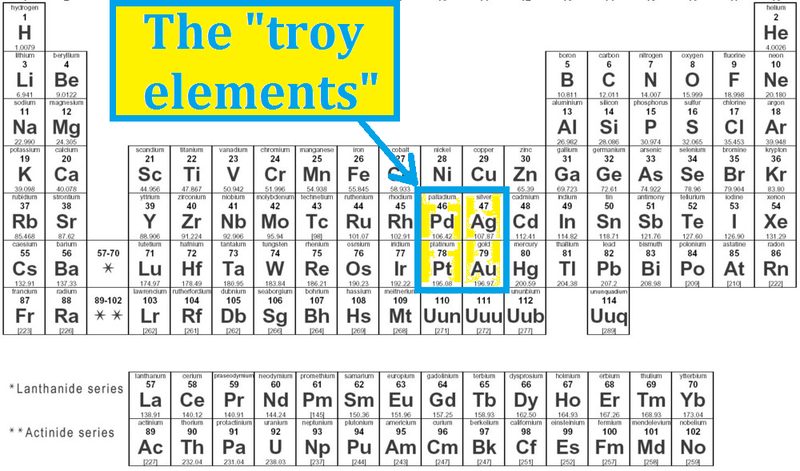 Also, as you can see here, these “troy elements” are all in one part of the periodic table. This is related to the numerous similarities in these elements’ physical and chemical properties, which is itself related, of course, to the suitability of these four elements for such things as jewelry, coinage, and bullion. In chemistry, of course, one must often deal with elements (as well as other chemicals) in terms of the numbers of units (such as atoms or molecules), except for one problem: this is absurdly impractical, due to the outrageously small size of atoms. Despite this, though, it is necessary to count such things as atoms in order to do much chemistry at all, so chemists have devised a “workaround” for this problem: when counting units of pure chemicals, they don’t count such things as atoms or molecules directly, but count them a mole at a time. A mole is defined as a number of things equal to the number of atoms in exactly 12 grams of pure carbon-12. To three significant figures, this number is 6.02 x 10²³. To deal with moles, since atoms have differing masses, we need to know the molar mass (mass of one mole) of whatever we are dealing with to convert, both directions, between moles and grams. Here are the molar masses of the four troy-measured elements, as seen on the periodic table above, below each element’s symbol. I’ve given these numbers as the information needed to solve the following problem: rank one dozen precious metal cubes (descriptions follow) by ascending order of volume. 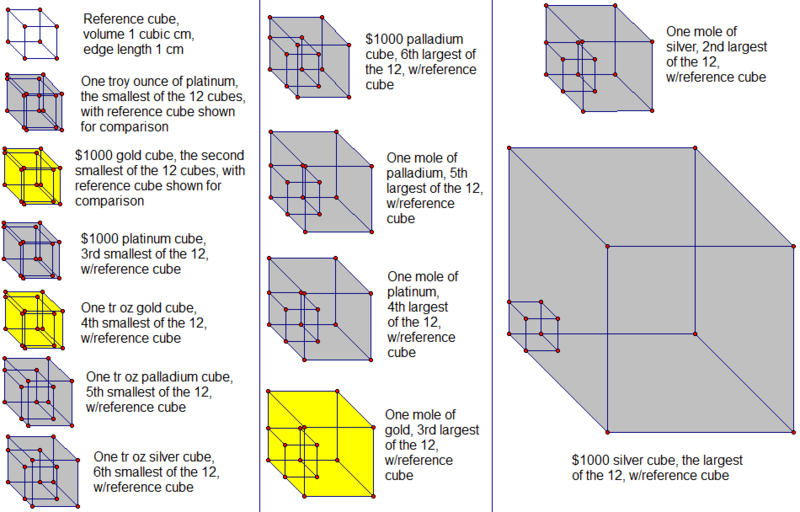 There are three cubes each of gold, palladium, platinum, and silver. Four of the twelve (one of each element) have a mass of one troy ounce each. Another four each have a value, at the time of this writing, of $1,000. The last set of four each contain one mole of the element which composes the cube, and, again, there is one of each of these same four elements in the set. If you would like to do this problem for yourself, the time to stop reading is now. Otherwise (or to check your answers against mine), just scroll down. Gold worth $1000, at the time of this posting, would have a troy mass, and then a mass in grams, of $1000.00/($1,094.00/tr oz) = (0.914077 tr oz)(31.103 g/tr oz) = 28.431 g. This mass of gold would have a volume of v = m/d = 28.431 g / (19.3 g/cm³) = 1.47 cm³. A cube with this volume would have an edge length of 1.14 cm. Platinum worth $1000, at the time of this posting, would have a troy mass, and then a mass in grams, of $1000.00/($965.00/tr oz) = (1.0363 tr oz)(31.103 g/tr oz) = 32.231 g. This mass of platinum would have a volume of v = m/d = 32.231 g / (21.46 g/cm³) = 1.502 cm³. A cube with this volume would have an edge length of 1.145 cm. One tr oz, or 31.1 g, of gold would have a volume of v = m/d = 31.1 g / (19.3 g/cm³) = 1.61 cm³. A cube with this volume would have an edge length of 1.17 cm. One tr oz, or 31.1 g, of palladium would have a volume of v = m/d = 31.1 g / (11.9 g/cm³) = 2.61 cm³. A cube with this volume would have an edge length of 1.38 cm. One tr oz, or 31.103 g, of silver would have a volume of v = m/d = 31.103 g / (10.49 g/cm³) = 2.965 cm³. A cube with this volume would have an edge length of 1.437 cm. Palladium worth $1000, at the time of this posting, would have a troy mass, and then a mass in grams, of $1000.00/($600.00/tr oz) = (1.6667 tr oz)(31.103 g/tr oz) = 51.838 g. This mass of palladium would have a volume of v = m/d = 51.838 g / (11.9 g/cm³) = 4.36 cm³. A cube with this volume would have an edge length of 1.63 cm. A mole of palladium, or 106.42 g of it, would have a volume of v = m/d = 106.42 g / (11.9 g/cm³) = 8.94 cm³. A cube with this volume would have an edge length of 2.07 cm. A mole of platinum, or 195.08 g of it, would have a volume of v = m/d = 195.08 g / (21.46 g/cm³) = 9.090 cm³. A cube with this volume would have an edge length of 2.087 cm. A mole of gold, or 196.97 g of it, would have a volume of v = m/d = 196.97 g / (19.3 g/cm³) = 10.2 cm³. A cube with this volume would have an edge length of 2.17 cm. A mole of silver, or 107.87 g of it, would have a volume of v = m/d = 107.87 g / (10.49 g/cm³) = 10.28 cm³. A cube with this volume would have an edge length of 2.175 cm. Silver worth $1000, at the time of this posting, would have a troy mass, and then a mass in grams, of $1000.00/($14.82/tr oz) = (67.48 tr oz)(31.103 g/tr oz) = 2099 g. This mass of gold would have a volume of v = m/d = 2099 g / (10.49 g/cm³) = 200.1 cm³. A cube with this volume would have an edge length of 5.849 cm. Finally, here are pictures of all 12 cubes, with 1 cm³ reference cubes for comparison, all shown to scale, relative to one another. A third of these cubes change size from day-to-day, and sometimes even moment-to-moment during the trading day, if their value is held constant at $1000 — which reveals, of course, which four cubes they are. The other eight cubes, by contrast, do not change size — no precious metal prices were used in the calculation of those cubes’ volumes and edge lengths, precisely because the size of those cubes is independent of such prices, due to the way those cubes were defined in the wording of the original problem. There is a chemical element, bismuth, which many people — even chemists — think has at least one stable isotope. However, the truth, discovered in 2003 (but still not well-known), is that it has no stable isotopes, but does have one with an extremely long half-life — so long that it, and other isotopes with similarly-long half-lives, are often deemed “effectively stable.” Bismuth is shown in green on the table, and its “effectively stable” isotope, bismuth-209, has a half-life of at least 1.9 x 1019 years. For comparison, it has “only” been ~1.38 x 1010 years since the Big Bang. Bismuth-209’s half-life is, therefore, over a billion times longer than the total amount of time which has existed, so far. 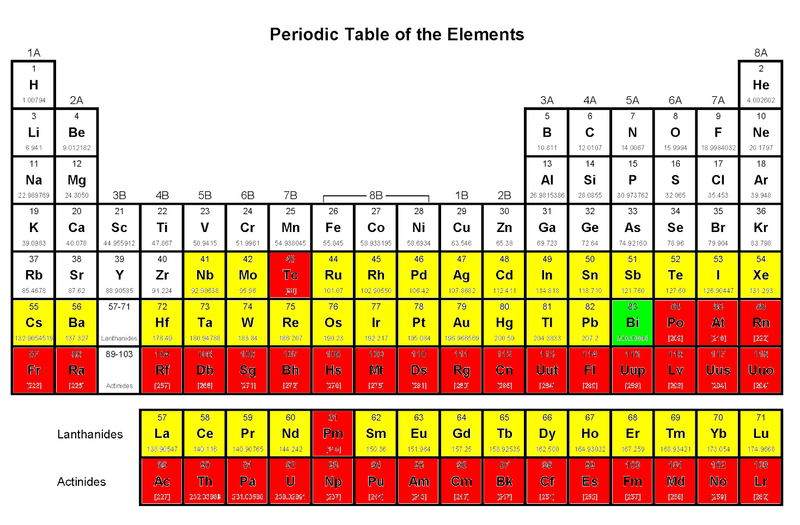 In addition, the yellow boxes indicate elements which have only radioactive and “observationally stable” isotopes. “Observationally stable” means that radioactivity (in some cases, even the spontaneous-fission variety), with an extremely long half-life, is predicted, or at least thought to be possible, but no actual decay has yet been observed — so the yellow elements’ perhaps-stable, perhaps-not isotopes are “on watch.” The red boxes, by contrast, are for elements which have been long-known to have no stable isotopes. None of this takes into consideration the unresolved issue of hypothesized long-term proton decay. If protons turn out to be unstable, all atoms likely are as well, unless simply having them exist in atoms somehow stabilizes them, as is the case for neutrons, which decay in isolation, but do not in stable nuclei. This is an area of uncertainty — another way of saying that this is something which needs further study.